The city of Amarillo, about 330 miles (531km) northwest of Dallas-Fort Worth, is where the old West lives on in the commercial centre of the Texas panhandle. Amarillo was founded in 1887 as a 'buffalo-hide tent camp' for railroad construction workers. Today, the town boasts a convention centre, symphony, ballet, theatre, opera, and two higher education facilities, Amarillo College and Texas State Technical College. 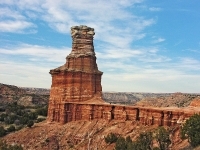 Amarillo's fortunes have long rested on the horns of cattle ranching, but it has also become a popular stopover for tourists keen to play cowboy, with numerous motels and restaurants having opened up in recent years. The town is located on the major Route 1-40 east-west highway, making it easily accessible for visitors and those who come for the famed frenetic Amarillo Livestock Auctions. We are looking for contributors for our Amarillo travel guide. If you are a local, a regular traveller to Amarillo or a travel professional with time to contribute and answer occasional forum questions, please contact us.